Muffins are the most versatile of baking delights. They're probably one of the easiest things to make and hard to mess up. 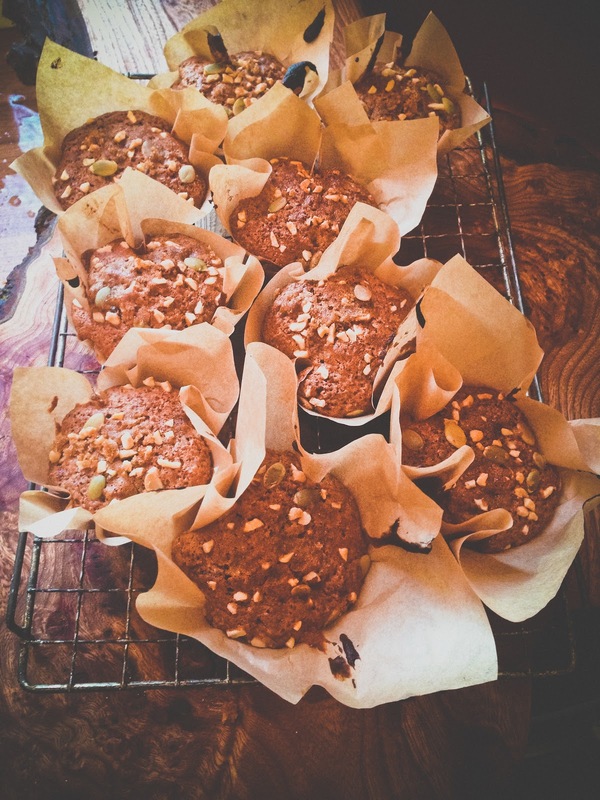 We have loads of gorgeous muffins recipes on Domestic Sluttery so whether you fancy a savoury muffin stuffed full of cheese , a sweet version like Laura's quite frankly GENIUS churros muffins we have a bounty of muffin recipes that you can make this weekend, we even have gluten free muffins, huzzah! MUFFINS FOR EVERYONE! I've been reading Jude Blereau's Wholefood Baking book this week which is out soon and is brilliant. Not only is it full of recipes that use all those ingredients that make you feel healthier just by looking at them (buying things like linseeds makes me feel all healthy and righteous) but she also gives great guidance about how to play around with quantities and ingredients so you can really experiment. I wish there were more baking books like this as I can't help fiddling with recipes and this often results in baking sorrow. 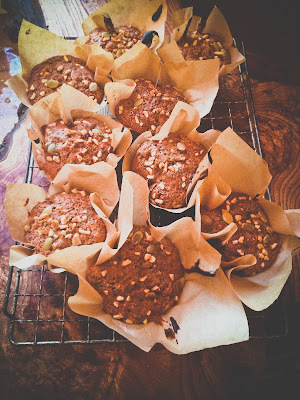 I've made these fruit and nut muffins using mostly wholewheat flour and used Jude's ratio guidance in the muffin section to add dried fruits and syrup, and I've already been told asked politely to make them again, "soon". You could swap out the dates for dried figs if you prefer and when it comes to the topping you can use whatever nuts and seeds take your fancy, don't miss out the topping though as the caramelised sugars and nuts give them a wonderful crunch. Preheat the oven to 190C/ Combine all the wet mix ingredients in a bowl and leave to infuse. In a separate bowl combine all the dry ingredients and mix well then carefully fold in the wet mixture until its just combined. It's really important that you don't over mix as your muffins won't be light be light and fluffy. In a third bowl combine your topping ingredients and mix well. Put muffin papers into your muffin tray then divide the mixture between them all. Sprinkle over the topping, it will seem a lot but don't worry it will be awesomely crunchy. Bake for about 35 minutes or until you can pop a skewer into the centre and it comes out clean. Eat warm!